PORTLAND, Ore. (CNS) — This November, Oregonians will vote on whether the nation’s oldest statewide sanctuary law will remain in place. State election officials announced July 17 that Initiative Petition 22, the “Stop Oregon Sanctuaries” campaign, has enough valid signatures to make the fall ballot. Oregon’s sanctuary status prohibits state and local resources, including police officers, from being used to enforce federal immigration law if a person’s only crime is being in the country illegally. It was enacted more than 30 years ago in an attempt to protect residents from racial profiling. 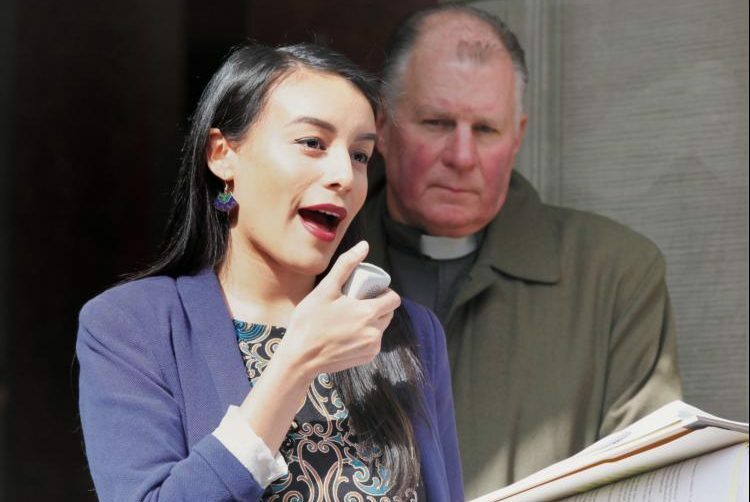 Community and faith leaders, including Catholics, expressed concern over the ballot measure, backed by Oregonians for Immigration Reform and the national group Federation for American Immigration Reform. If the measure passes, “it will contribute to the moral flogging immigrants are already experiencing due to a constant barrage” of anti-immigrant policies, said Kat Kelley, director of strategic initiatives for Catholic Charities of Oregon and director of the agency’s Pope Francis Center, which promotes volunteer work and charitable and social justice efforts. A repeal of sanctuary law “would be another defeat for the immigrant community and their allies” and could potentially keep families from obtaining critical services, she said. The Oregon Catholic Conference, public policy arm of the state’s Portland Archdiocese and Baker Diocese, has not yet taken a position on the measure, although it may in the upcoming weeks. Even if the bishops recommend a particular vote, “this will likely be a matter of prudential judgement for Catholics,” said Todd Cooper, director of the conference. As with all topics within the immigration debate, Catholics “must be guided by charity and concern for neighbor,” he said. Members of more than 100 faith, business, labor and civil rights groups, along with law enforcement leaders, have joined Oregonians United Against Profiling, a campaign to defeat the ballot measure. Oregonians for Immigration Reform, one of the ballot initiative’s primary supporters, pushed for 2014’s Measure 88, which overturned a state law that would have allowed immigrants in the country illegally to access driver cards. The measure comes as sanctuary laws around the United States face increasing criticism from President Donald Trump’s administration. There currently are a handful of states with sanctuary status, including California, and numerous sanctuary cities. The ballot intuitive to end sanctuary was sponsored by three Republican state representatives: Greg Barreto, Mike Nearman and Sal Esquivel. Oregon’s sanctuary law was not always controversial, originally receiving support from state Democrats and Republicans. Members of law enforcement also have supported it. The law emerged out of a 1977 incident in which a U.S. citizen of Mexican descent was interrogated publicly about his immigration status by law enforcement officers. A decade later, the case inspired a bill that created Oregon’s sanctuary law. “Whatever your views on the national immigration debate are, it makes no sense to throw out a law that has worked well since 1987,” she said. Catholic Charities’ Kelley said she’s “very, very concerned” that the measure could pass and that the consequences would be devastating to a vulnerable population. The measure is clearly part of the broader push to keep immigrants from entering the United States, said Kelley. “But this law or any law is not going to stop families from crossing the border,” she said. “They cross because they have to. A vast majority are seeking asylum because of what is happening in their country. Any parent, anybody with a child — a godchild, niece or nephew — would do the same.